Review: Fans of the Edge series will see a few familiar names in this book. George, Jack, Gaston and Sophie all make an appearance. 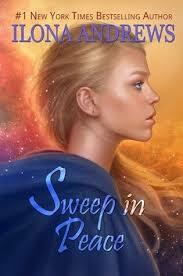 Sweep in Peace starts a few months after the previous book ended. Sean is on some unknown intergalactic adventure and Dina cannot stop thinking about their kiss. One evening, an Arbiter shows up (it's George!) asking Dina if she is willing to host a peace summit for between 3 warring groups. It's dangerous, people will probably die..but Dina needs the money so she agrees. Like most books by this writing duo, I loved it! I loved Dina's dry humor, Calendia never disappoints and Arland..oh Arland, you are too funny. Dina also hires a chef in this book and he was funny as well. Overall, great world building, great story and lots of chuckles.